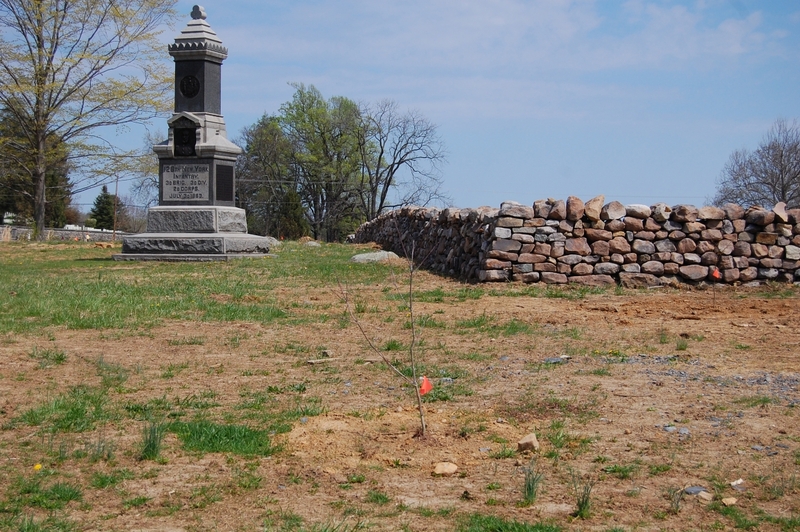 Volunteers from the Gettysburg Foundation planted trees in Ziegler’s Grove this month. The orange flags mark their locations. We’re standing in the old Cyclorama parking lot.This view was taken facing west at approximately 2:50 PM on Sunday, April 2, 2017. 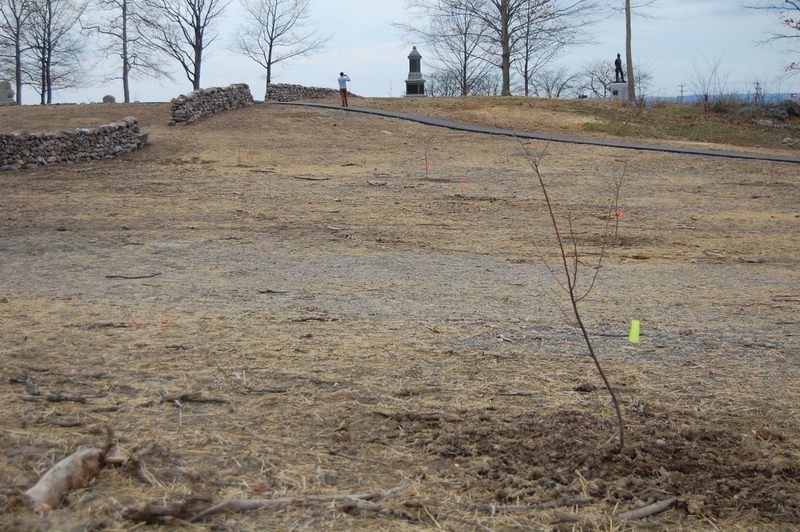 The trees were planted as part of the National Park Service’s efforts to restore Ziegler’s Grove after the removal of the Cyclorama Building.This view was taken facing west at approximately 2:50 PM on Sunday, April 2, 2017. Normally this is where we would say, “restore Ziegler’s Grove to its 1863 appearance,” but the aesthetics of the restoration and the Hancock Avenue Gate are from the Park’s “Commemorative Era,” when Gettysburg’s battlefield was managed by the War Department.The monument to the 126th New York is in the center background. This view was taken facing west at approximately 2:50 PM on Sunday, April 2, 2017. 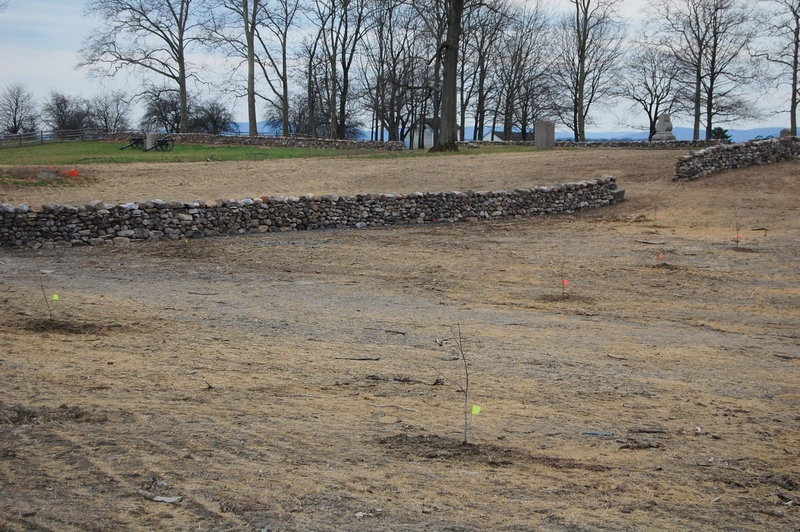 The trees that were planted this month are located on the north side of this stone wall. 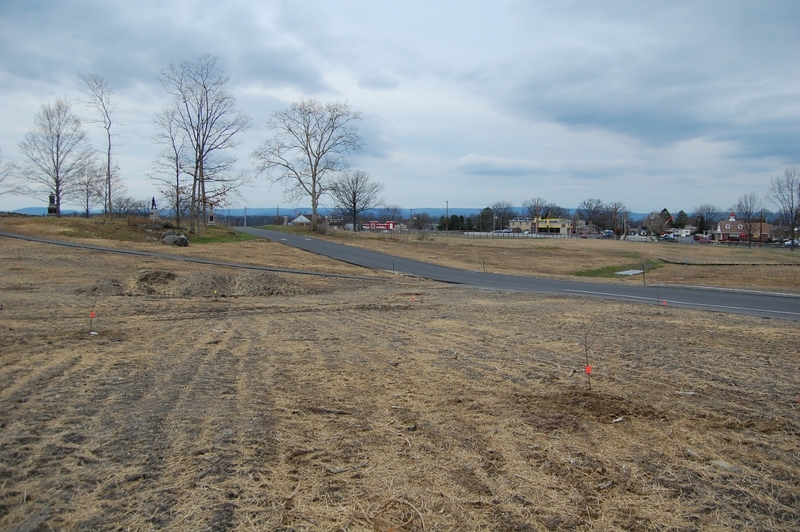 At Thursday night’s Gettysburg National Military Park Advisory Commission meeting, it was mentioned that there are still “some pathways” that need to be placed in the area, but that the Park’s plan is in its final phase.This view was taken facing west at approximately 2:50 PM on Sunday, April 2, 2017. Trees were also planted along Hancock Avenue by the recently constructed stone walls. 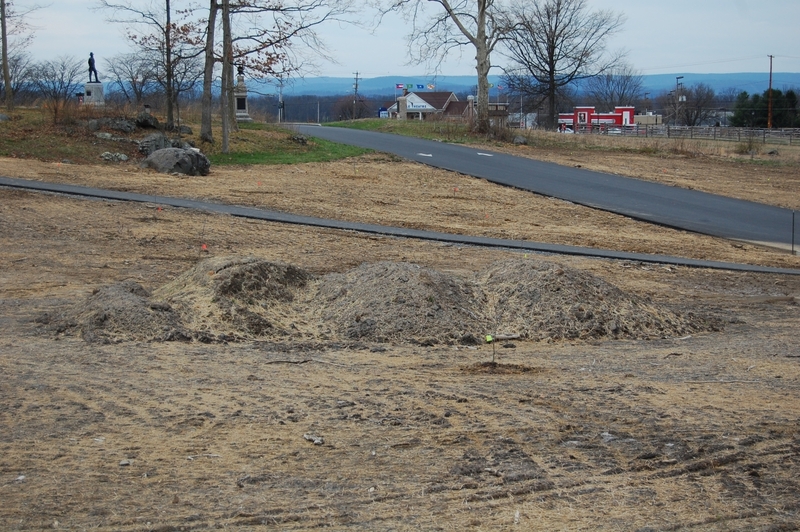 The 126th New York monument is on the left.This view was taken facing east at approximately 3:00 PM on Friday, April 14, 2017.